Developers behind a new retail park say they are in ‘advanced negotiations’ with national operators to fill the remaining units. Lidl and a McDonald’s drive-thru restaurant have already been lined up for the retail park in London Road, Wellingborough, and it is hoped talks will help secure further names to fill the site, which is due to be completed this autumn. The news comes as St.Modwen, the company behind the new Wellingborough development, recently posted record-breaking half year results on the Stock Exchange. The regeneration specialist said much of its success is down to the growing regional economy, which has seen schemes like the London Road one progress and attract new businesses such as Lidl and McDonald’s. Rupert Wood, St. Modwen’s regional director for the Northern Home Counties, said: “In the Northern Home Counties we are continuing to build our portfolio through new development and investment in our existing assets. “St. 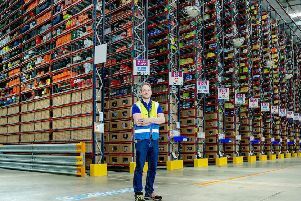 Modwen has increased its speculative development and in the region we have speculatively developed 90,000 sqft of industrial space in Letchworth on our 4.5 acre site. “The project is due to complete this summer and we have placed under offer all 90,000 sq ft to two occupiers. “From a retail perspective, we have secured lettings to Matalan, the Gym Group and Store 21 at Edmonton Green shopping centre, Enfield, totalling 65,000 sq ft and we are in advanced negotiations with national operators on the remaining 8,000 sq ft at our retail park on London Road, Wellingborough, who will join Lidl and McDonald’s. “The development will be completed in the autumn. “In Wolverton, we are preparing to submit a planning application for the regeneration of the 40 acre Wolverton Works site, which will provide new homes and employment space needed to meet residential and employment needs in Wolverton and Milton Keynes. Plans for the Wellingborough retail park were approved for the brownfield site back in April 2014. It had been derelict for some time before and is adjacent to the Castlefields retail park, which includes an M&S Simply Food store, Dunelm and Pizza Hut. The overall development is expected to create about 200 jobs.